Positive Body Image is linked to better health, regardless of weight. If you’re like most women, you might struggle with your body image, bashing your body to friends and obsessing over perceived flaws. Did you know that improving your body image can actually help you become healthier, without losing a pound? If you’re ready to learn more, read on! Why Worry About Body Image? Some of you may know that I was privileged to attend a 2-day body image workshop in Chicago last month. Honestly, it was the professional highlight of my year! In addition to learning from two amazing leaders in the world of body image healing, I also got to talk, brainstorm, and collaborate with 50+ other like-minded practitioners. It was such an incredible experience. I had to move mountains to attend, but I was so motivated because body image work is such an integral part of the process when I work with women on their Intuitive Eating journey. You see, body image comes up nearly every time I talk to a potential client. For many women, negative body image and self-talk starts at a young age and continues to bloom from there. Negative body image lets diet culture sneak in as well, because we begin to hate ourselves and our bodies, and we strive to attain the cultural definition of health and beauty, the thin ideal. Body image is complicated, especially in today’s modern world, where we are surrounded by re-touched images, not only on TV and magazines, but also in our social media feeds. It seems like everyone else is more fashion-savvy, better proportioned and has a perfect life, to boot. Unfortunately this barrage of images can send us into a downward spiral of inadequacy and shame. Society tells us that more polished and thin you are, the healthier you are. But science shows us that weight isn’t synonymous with health, and there’s more to health than the scale – lots more! And the way we feel about our body – our – plays a big part in our health So, what’s a girl to do??? Working on improving our own body image is a great first place to start! Why Focus on Body Image? Research shows us that most girls and women have poor body image, and it’s been declining for years. 40-60% of elementary school girls (ages 6-12) are concerned about their weight or about becoming too fat. (Smolak, 2011). 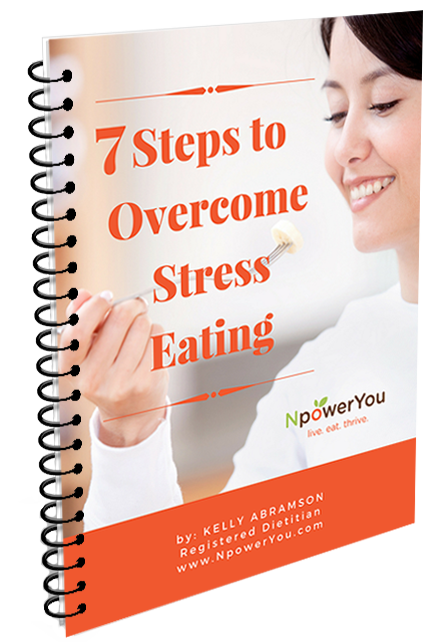 75% of American women endorse unhealthy thoughts, feelings or behaviors related to food or their bodies. when we hold ourselves and our bodies in low regard, we don’t treat them well. If there’s a person you don’t particularly like, do you go out of the way to do nice things for them? On the other hand, how do you treat the people you care for? think: best friend, spouse, child or parent. Do you remember to use kind language around them? Do you make sure they are well fed and well-rested? Do you reach out to them when they are sad or are having a challenging week? I’m betting you are answering Yes, Yes, Yes!!! 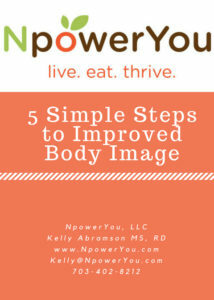 Improving our own body image actually drives us to choose more health-promoting and life-enhancing actions. I’m ready to give it a shot. How do I start to boost my body image and create a more positive one? After years and years of living in our toxic diet culture and our own negative self-talk, your negative body image is not going to be magically erased overnight. But if you commit to making one small change every day, you will start to see results in no time. Why is improved body image important for you now? Do you want to set a better example for your children? Have you finally had enough after years of hating your body with nothing good to show for it? Whatever yourmotivation is, use it to help keep you moving forward on your journey. Fill in the blank here: “I’m working on my body image for _________. Review your social media accounts. Ditch the social media that makes you feel worse about your body. Let’s face it, we are not going to start feeling better about ourselves when we continue to stare at images of bodies that meet society’s standards of beauty. It’s time to start removing the images and people that make you feel worse about yourself. And, you may find that even some who proclaim their allegiance to body positivity may still promote weight loss and dieting. As I mentioned in a prior post on rejecting diets, many diet companies (I’m looking at you Weight Watchers and BeachBody!) are using the language of body positivity cloaked around their diets. Look for those who promote Health at Every Size and size diversity. Body Positive social media should make you feel good about your body. If it makes you feel bad or you find yourself thinking about your body’s flaws, out it goes! Make a list of something you appreciate about your body every day. If you are feeling particularly negative, start with a neutral body part, like your hand or your ear. Think about why is this body part important to you. Perhaps your hands and fingers enable you to paint pictures; or it’s your legs that help you move around all day; or your ears that enable you to hear birds chirping. There are so many ways to start appreciating our bodies that move us toward improved body image. As women, this is something we face nearly every day. And it takes its toll on our bodies and our perception of them. It’s as if societally, it’s unacceptable to like our bodies! How crazy is that?! A friend or colleague, let’s call her Joan, might start with “my thighs got so huge over the winter. I can’t believe I’ve let myself go like this!” To which we might reply, “Well, look at my stomach! It’s never been this big!” After a conversation like that, what are you going to be thinking about for the rest of the day?…..
Ways you can nurture your body? If you’re like the overwhelming majority of women I know, all that negative talk and body bashing increases your own body dissatisfaction and doesn’t lead you on a positive path towards nurturing your body. But, what if we didn’t allow this negative self-talk to take hold? What if, when someone commented on her own thighs, we commented on that inspiring hike we took over the weekend, or that great book we’re reading? What would it feel like to talk about other things that make us the great women that we are? Dress Like You Deserve to Be Comfortable and Feel Proud of the Way You Look. Most of us have skeletons in our closets: too tight clothes that remind of us dieting, or of a much-earlier life when we had a different body. No good comes from tormenting ourselves with these ill-fitting clothes. Improved body image comes when we wear clothes that feel good and allow us to go out into the world with our head held high – regardless of our body size. Purge your closet of clothing that doesn’t fit comfortably and/or clothing that reminds you of your history of dieting. Congratulations! If you start following these steps, you’ll be on your way towards improved body image. These steps are just a few of the many ways that I help women ditch dieting and learn to love food and their bodies again. Are you ready to start working on your body image? Improving your body image and learning to love your body is a process. It takes time and sometimes there are setbacks along the way. But, every time that you choose to do something positive for your body, you are moving one step closer to achieving a positive body image. Could you use some more support? I’ve created a free printable PDF with tips and cut-out wallet cards to help you on your body image healing journey. Click here or on the image below to sign up and get the download link.